Yes, yes, it's still November, but it's November twenty-fourth which means it's one month until Christmas Eve. Which means it's one month until your home needs to be decorated, your cards and gifts delivered, and your excessive food shop completed. It's time to give Christmas some thought. I haven't always been like this. 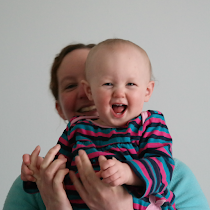 Pre-parenting, I was a bit of a Christmas cynic - "it's really just for the kids," I would say. Well, I have kids now (at least one - have I had the other yet? I drafted this in *ahem* September so, who knows? I might be in labour as you read it. Or in a newborn fug. Or throwing a strop because WHEN WILL THIS BABY ARRIVE?!) and, with them, came a renewed excitement about Christmas. Imagine their little faces when they see fairy lights! And reindeer! And eat their first bit of gingerbread! And imagine all the crafting we can do! Except... there's a limit to how much crafting you can expect of a toddler. 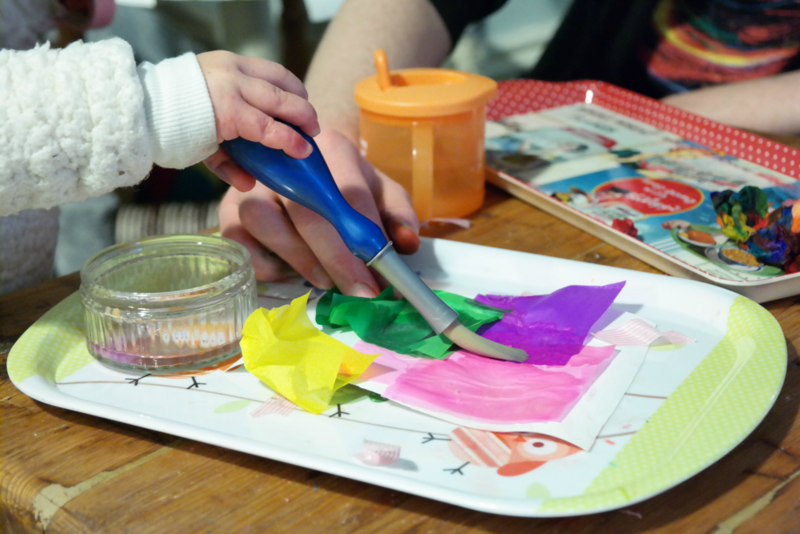 At two and a half, MM is showing an interest in doing arty projects; this time last year, she just wanted to slop around some paint or water and cover every surface in stickers. But that didn't mean that she couldn't "make" our Christmas cards or "wrap" our gifts. Here - with authentic taken-last-year-just-look-at-those-squidgy-little-fingers photos - is how I turned her obsession with stickers into a festive craftavaganza. Place small bits of coloured tissue paper on thick lining paper or white card. Cheap tissue paper works best. Paint the tissue paper with water. The colours will bleed. ADULTS: Cut the colourful results into triangles Christmas tree shapes. 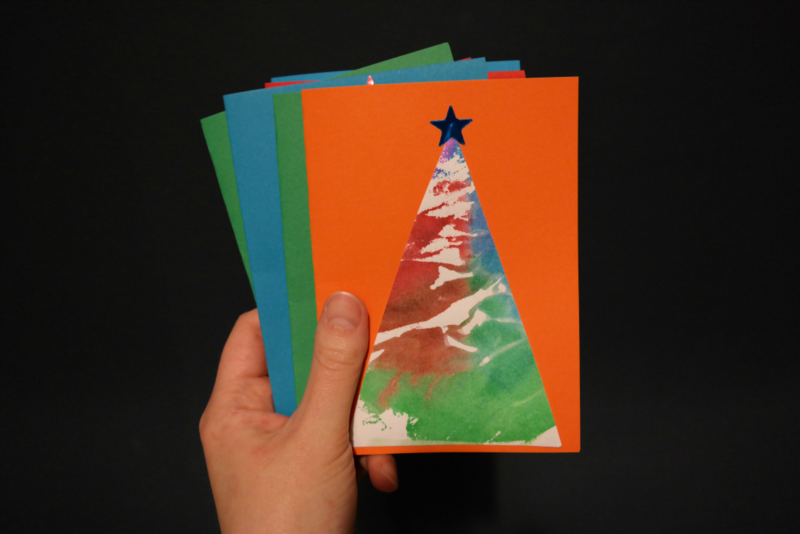 Stick the tress to colourful, folded card. 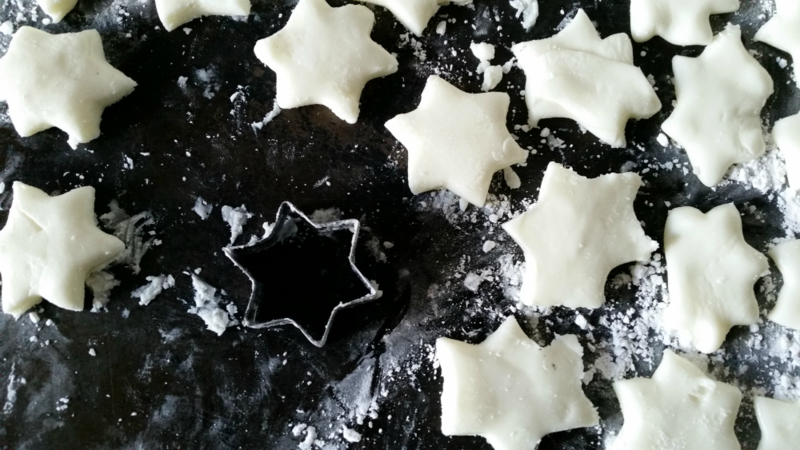 Use sticky stars or dots to decorate. So simple, right? And MM loved the painting with water bit (Steve and I got very into it, too). This is 100% just exploiting your kid's love of stickering. All we did was wrap the presents in brown paper (MM helped with the sellotaping) then let her go wild with sticky stars and bows. 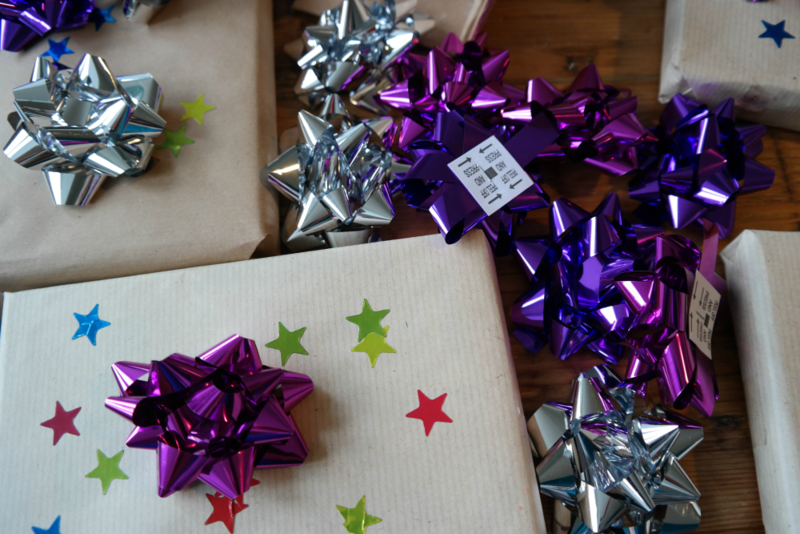 Some of the parcels had one star on them (eh... I might have added some later in a deliberately toddler-esque manner); some of them had eight or nine bows crammed one on top of the other. They looked great. Cut a triangle out of green cardboard. Let your kid decorate it with tape and/or sticky stars. Voilà! A Christmas tree! Cut a gingerbread man out of cardboard. Let your kid decorate it with tape and/or stickers and/or crayons. Hurrah! 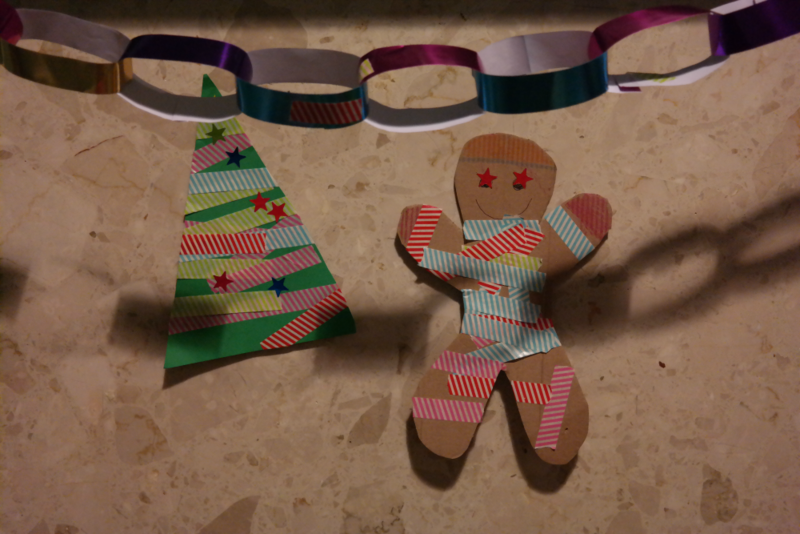 Cut/buy strips of shiny paper and make paper chains. This is a two adult project - one to help thread the paper strips through each other; one to help your toddler with the washi tape - but, despite this, is a really simple craft to do with a small child. When it comes to baking with a toddler, the simpler the better. 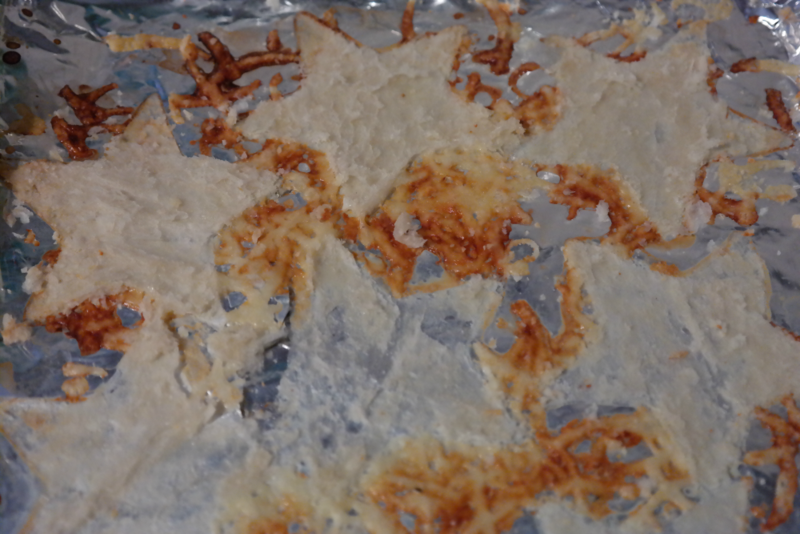 Anything which just involves smushing some ingredients together and then going at them with a cookie cutter is a winner. Both super-simple and really tasty. Get a sheet of pre-rolled puff pastry. Let your kid go wild painting the top of it with milk. Help them to grate some cheese on top using a rotary grater (one of the ones where you turn a handle and cheese falls out - very exciting!). Bake for however long it says on the packet. For more Christmas ideas (some very simple; some purely for us adults), why not follow my Pinterest board? My Winter board is worth a look, too.